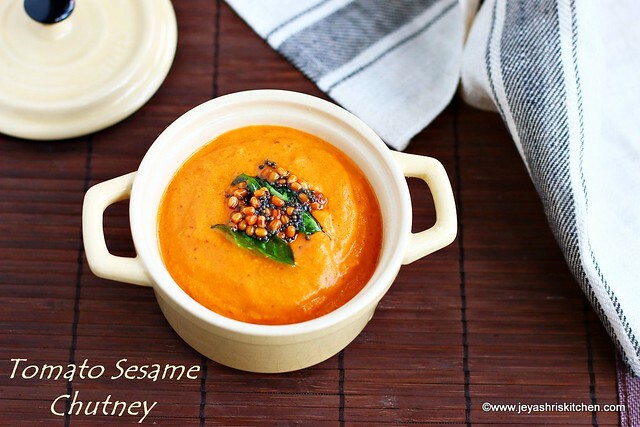 Tomato Sesame Chutney recipe| Tomato Nuvvula pachadi is a spicy Andhra style chutney recipe made using tomatoes, red chili, sesame seeds and green chili. 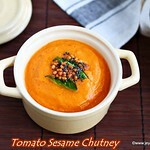 I wanted to post the tomato sesame chutney recipe with video but i could do with step by step pictures for this recipe. This Andhra style tomato chutney pairs well with Idli, dosa and tastes well with Curd rice too. I have tasted this chutney in Hyderabad few times, but this time i somehow could make out the other ingredients in the chutney. I tried this today and it tasted so similar to the restaurant style chutney | pachadi. The one i made is not too spicy, but you can increase the chilis to make it more spicy. Check out my other Andhra style recipes. Description: Tomato Sesame Chutney recipe| Tomato Nuvvula pachadi is a spicy Andhra style chutney recipe made using tomatoes, red chili, sesame seeds and green chili. In a pan add oil(reserve 1 tsp for tempering) and add the sesame seeds, tamarind, red chili, green chili and garlic cloves. Saute in a medium low flame. Once the sesame seeds changing brown color, simmer the flame and transfer this to a plate. Add in the chopped tomatoes and cook till they turn mushy. Cool this completely and grind into a fine paste. In a pan add 1 tsp oil and temper with mustard seeds, urad dal and curry leaves. Tomato Sesame Chutney is ready to serve. This can be packed for travel too. You can add few curry leaves while grinding to enhance the taste. 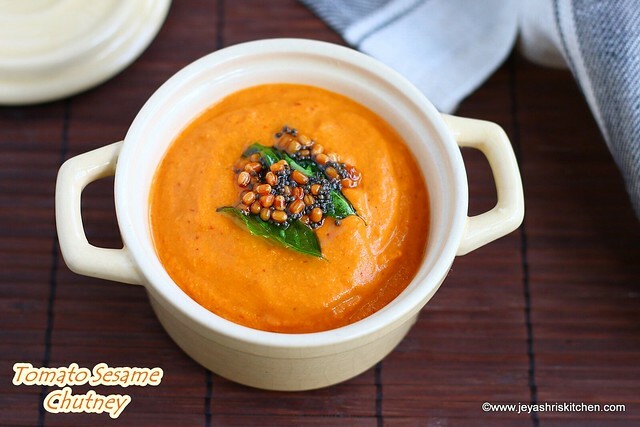 Tomato Sesame Chutney goes well with idli, dosa, chapathi and also with curd rice too.